The alarm clock rang at 5.30am, I crept out of our cabin to inspect the sky. It was quite overcast. So I decided that two hours in bed were way more preferable than the prospect of waiting for a sunrise at Lake Matheson which would in all likelihood not happen anyway due to the clouds. Lake Matheson is that little lake at the foot of Mount Cook where every one goes and tries to take a picture with the mountain range reflecting itself in the often mirror like surface of the lake. 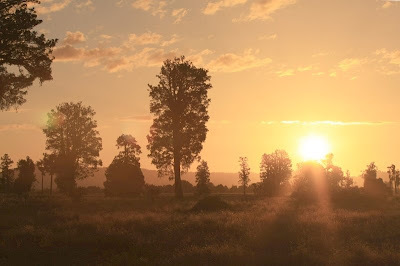 The best time for doing that is sunrise and sunset. 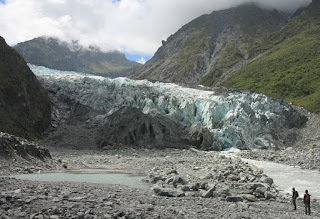 First order of the day was an appointment with the Fox Glacier. One of the few glaciers that are advancing despite the climate change. About two meters a year since 1985. On the surface of the glacier the ice is moving up to 7 meters a day. Knowing all that, I was not surprised to see a guy at the glacier view point using his video camera to capture the action. 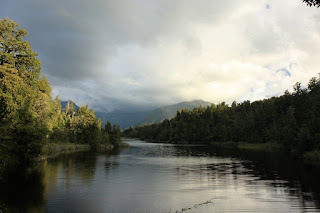 When we went to Lake Matheson for the sunset picture taking, there was sun, but the mountains were still veiled and the wind insisted on keeping the surface of the lake rippled. There is an up side to this: My Lake Matheson shots will be really unique and not these perfect ones every one else takes. Highly overrated anyway! On our way back from the lake we were pleasantly surprised to find that the Matheson Café does not close at 5pm as advertised in the guide book. They had a full dinner menu and even kept open past their normal closing time of 9pm because we and a few other guests arrived late. Highly recommended if you are in the region.